"With a great lead female protagonist, richly colorful set of secondary characters, plenty of roaring action, and an intense storyline that allows no boring moments, “Voodoo Child” is an intense, entertaining and memorable novel. Highly recommended." The Columbia Review. 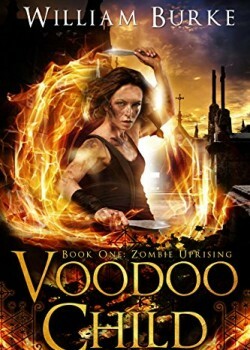 For readers who enjoy original horror and supernatural fiction, “Voodoo Child” (Book One of a forthcoming “Zombie Uprising” series) by William Burke offers a highly realistic yet truly imaginative story. The novel stars army chopper pilot Maggie Child who, true to her chosen profession, is meticulous, well-trained, and approaches tasks with an almost scientific logic. Her job as a flying servicewoman, however, is obviously dangerous. When the worst happens—being shot down over Iraq—her path veers from aerodynamics and war to the realm of the paranormal, drawing her into an otherworldly and nightmarish fight for physical and mental survival. Demons and mercenaries, mad scientists and deformed victims, Caribbean voodoo and apocalyptic zombie conspiracy, and even a serving of good old passion, all combine to challenge Maggie and transform her into the heroic woman she was always destined to become. Adding to the excitement, the author’s extensive knowledge of both war and lore enhances the drama so that even the well-informed reader will find a wealth of fascinating facts and myths. In summary, with a great lead female protagonist, a richly colorful set of secondary characters, plenty of roaring action, and an intense storyline that allows no boring moments, “Voodoo Child” is an intense, entertaining and memorable novel. Highly recommended.